These were the opening words in worship on March 31, 2013, at the First Parish in Needham. This day just like all the ones before it. And suddenly, a blaze of light, doubled by the water beneath it. I thought of all the days before. Days of success and those of failure. This day, all of those are gone, behind me. This day, just like all those before it, the sun rose. The winter ends, the spring begins, the snow leaves, the flowers burst forth. 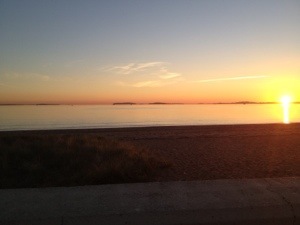 A new day dawns over Wollaston Beach, a new day for all of us. And so a new day begins.